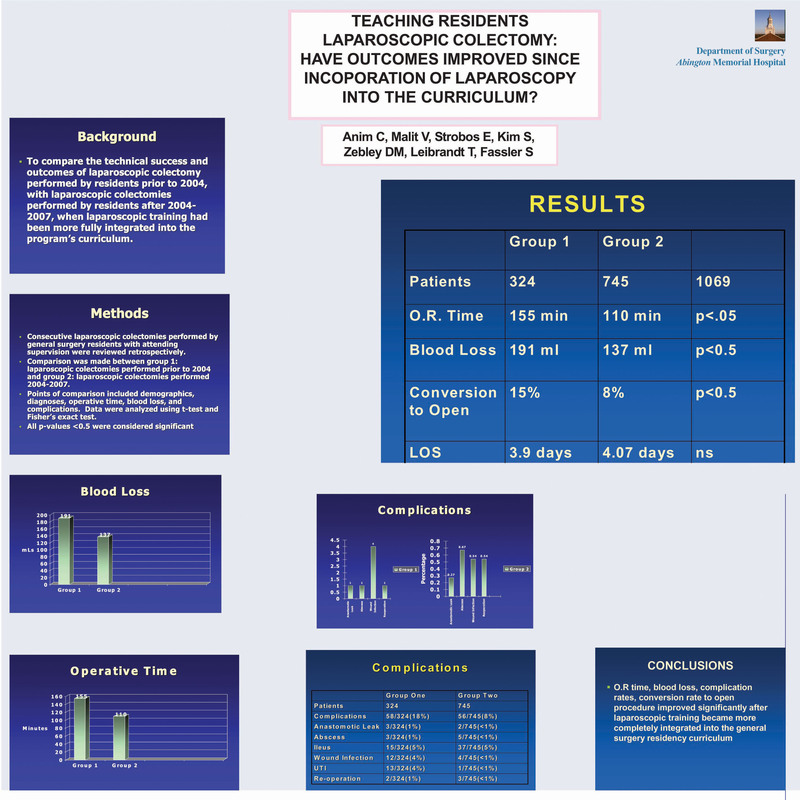 Background: This study was undertaken to compare the technical success and outcomes of laparoscopic colectomy performed by residents prior to 2004, with laparoscopic colectomies performed by residents after 2004, whose laparoscopic training has been more fully integrated into the program’s curriculum. Method: 1069 consecutive laparoscopic colectomies performed by general surgery residents with attending supervision were reviewed. Comparison was made between group 1: laparoscopic colectomies performed prior to 2004 and group 2: laparoscopic colectomies performed after 2004. Points of comparison included demographics, diagnoses, operative time, blood loss, and complications. Data were analyzed using, using t-test and Fisher’s exact test. Results: 1069 patients underwent laparoscopic colectomy during the study period. Group 1 contained 324 patients who underwent a laparoscopic colectomy prior to 2004. Group 2 contained 745 patients who underwent a laparoscopic colectomy after 2004. The mean age and preoperative diagnoses were similar between the two groups (62yrs vs 66yrs). Operative time was improved with Group 2. (110 minutes vs 155minutes p<.05). Blood loss was also improved with Group 2 (137ml vs 191ml p<0.5). Complication rates were also improved in Group 2 with p<0.5. Length of stay among the two groups were equivalent (3.9 days vs 4.07days p=0.36) as well as conversion to open procedure and post op complications. Conclusion: With the increase in laparoscopic training, resident surgeons have become more efficient and skilful in laparoscopic techniques and this study demonstrates their improved operative time, blood loss, and complication rates.